The Malaysian government has ushered in its Visit Malaysia Year 2007 program. Malaysia is rich in the diversity of its geographical features such as lush rainforests, pristine beaches, mysterious caves and captivating seas. Here is a list of the places that nature lovers or tourists can go and the things you can do out there in the Malaysian wilderness. 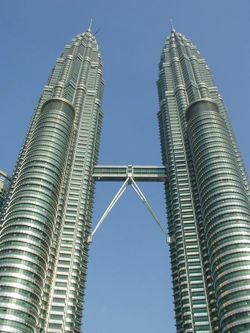 Kuala Lumpur (KL) is one of the most thriving metropolitans in Asia with its Garden City concept. The Orchid and Hibiscus Garden located at Taman Tasik Perdana houses over 800 species of orchids and 500 variety of hibiscus – the country’s national flower. Just opposite the Garden is the City’s Bird Park, which features avian species from all over the world, including the endangered Sarawak Hornbill. The Butterfly Park which is located just around the road is home to over 6,000 butterflies from 120 species. Rock and Roll, one of the country’s greatest adventure playgrounds can be found in Sleepy Gopeng. Stretched over a kilometer from Sungai Siput to Kuala Dipang is the shadow of Tempurung Cave, the most famous of Gopeng’s limestone caverns and flowstones. A gallery of fascinating rock formations formed by stalactites and stalagmites over thousands of years can be found within Tempuring cave’s five magnificent domes. About 15 minutes from Tempurung cave lies with Kandu cave. This is the place to do caving. Climb, slip and slide your way through the cave’s belly, through its narrow pathways and emerge from its enormous mouth into rustic wilderness. Another cave worth visiting is Angin cave, so called for its much breezier wind tunnel. What makes Angin cave Angin special is how the crystallites within the rock sparkle under the beam of a flashlight. Additionally, Sungai Kampar and Sungai Itik, just minutes from the caves, have emerged as some of the most exciting ‘Tubing’ and white water rafting destinations in the peninsula. A handful of campsites have also emerged in the area with activities such as abseiling, rock climbing and flying fox popular among visitors. Generally February is a great time to be there because the water levels are nice and high. Taman Negara is the most popular national park in the country. Spanning an amazing 4,343 sq.km, the park’s green valleys and scenic rivers are crowned by Mount Tahan, the peninsula’s highest peak. Taman Negara National Park was established in Malaysia in 1938/1939 as the King George V National Park. It was renamed to Taman Negara after Independence, which literally means “national park” in Malay. What makes this place popular is that the park is accessible although located in the wilderness of Pahang. Amongst the park’s greatest attractions, besides animal observations, are its salt slicks, canopy walk, angling, bird watching, photography, caving and rock climbing. 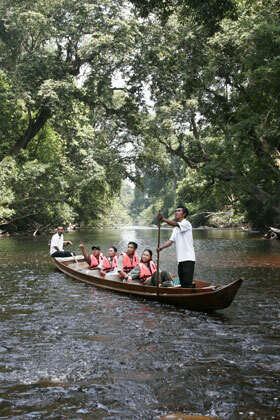 Taman Negara National park has been developed into a famous ecotourism destination in Malaysia. There are several geological and biological attractions in the park. 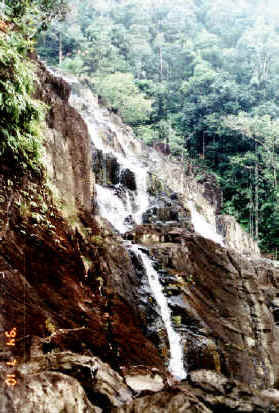 Gunung Tahan is the highest point of the Malay Peninsula; climbers can use Kuala Tahan or Merapoh as their departure destination. Taman Negara is the home of some rare mammals, such as the Indochinese Tiger, Sumatran Rhinoceros, Malayan Gaur (seladang) and Asian Elephant. Tahan River has been preserved to protected the Malaysian mahseer (ikan kelah in Malay), a type of game fish. Endau-Rompin is very special. Spanning over two states, Pahang and Johor, the park encompasses the watersheds of the rivers Endau and Rompin and over 488 sq.km of forest. This forest is not only beautiful, but also important, as it is one of the last remaining habitats of the wild Sumatran rhinoceros in Peninsular Malaysia and hosts a diversity of plant and animal life within. Other wildlife found in Endau Rompin National Park include tigers, elephants, white handed gibbons, drongos, hornbills and a host of other birds, mammals, amphibians and reptiles. Endau Rompin National Park is a tropical rainforest in Malaysia and alsothe second largest national park in the peninsula after Taman Negara. The park is one of the oldest tropical rainforests in the world and boasts rock formations some 248 million years old. Bigfoot was suposedely seen in this National Park in 2005. The East Coast is blessed with among the most gorgeous seside attractions in this part of the world. Take your pick from Tioman Island, Redang Island, Kapas Island, Tenggol Island or the stunning Perhentian Island. The Terengganu islands are a sun-and-sea playground, offering activities like picnics, beach volleyball, swimming and snorkeling. Driving off the waters of the East Coast islands is said to be one of the most rewarding activities one can indulge in, what with its fascinating collection of marine life and mysterious wrecks. The best time to visit east coast islands is in May and June. There are number of reasons why Unesco has awarded Mount Mulu National Park World Heritage Site status. Sarawak Chamber (600m by 415m and 80m high) is the largest cave chamber in the world. Clearwater Cave (51.1km) is the longest cave system in South-East Asia. Gunung Mulu (2,376m) is the second highest peak in Sarawak. And then, there is Gunung Api, which is 1,750m above sea level and has one of the most impressive pinnacles in the country. Mount Mulu National Park is Sarawak’s largest national park, spanning 544 sq km. Sipadan is a nice place for diving. Millions of “Technicolor” reef fish, schools of glimmering, barracudas, turtles, sharks… The international dive community does not exaggerate when it includes Sipadan in the five top diving destinations in the world. At 4,093m, Mount Kinabalu is the highest peak in South-East Asia and dominates the picturesque landscape of the Kinabalu National Park. Just 84km from Kota Kinabalu and spanning 754 sq km, the park is not only popular amongst climbers but also nature enthusiasts who are keen to see the butterflies, birds and other animals here, as well as unusual plants like the nepenthes pitcher plants, wild orchids and the Rafflesia. Mount Kinabalu/Gunung Kinabalu is a prominent mountain in Southeast Asia. It is located in Kinabalu National Park (a World Heritage Site) in the east Malaysian state of Sabah, which is on the island of Borneo in the tropics. Cameron Highlands was ‘discovered’ in 1885 by William Cameron, who described the place as “a fine plateau with gentle slopes, shut in lofty mountains.” Although developed to the extend of becoming the country’s most important producers of tea, flowers, fruits and vegetables, Cameron Highlands continues to be one of the most relaxing natural retreats in Malaysia. Contrary to the popular belief that Cameron_Highlands embodies a very English worldview, the place is actually very Malaysian. Amidst the mist-covered mountains and the immaculately kept tea plantations, locals of all cultures can be seen going about their daily affairs in the farms and markets. Between strawberries and cream, and the fresh vegetable steamboat on a cool and misty night in the company of good friends, Cameron Highland is always worth revisiting over and over again! Set in some of the most remote places in Borneo, Bario is a mysterious mountains place and home to some of the gentlest and kindest people you will ever meet. Welcome to the Kelabit Higlands, rugged, beautiful and serene. At the end of the year, the mountains and valleys comprising the highlands are golden with the famous Bario rice – said to be a grade above all other, enticing even the meticulous Japanese to seek them out. 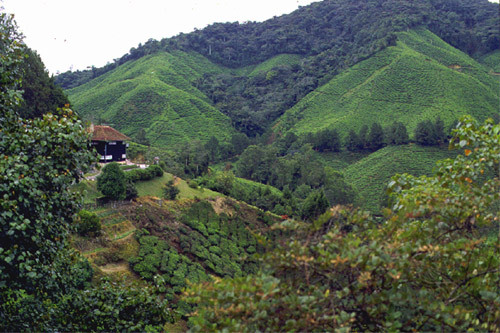 The highlands are steep with the legends and myths, along with the humble hospitality, of the Kelabits. Go jungle trekking, shoot a blowpipe, visit the rivers and the waterfalls, harvest rice and stay with the people. The Kelabit Highlands experience is all about a return to the simple way of life of spiritual contentment. This entry was posted on Wednesday, January 3rd, 2007 at 6:24 pm	and is filed under Advice and Guide. You can leave a response, or trackback from your own site.